Ever since that day I’ve wanted to interview him to see his view of the (geospatial) world—and a few weeks ago I got the chance. ND: Congratulations on 10 years as CTO at Esri UK. In that decade, with regard to GIS, what has been the biggest change? CK: The acceleration of growth of computing power has meant we can do many of the things we have struggled in the past to accomplish, so it is now possible to do some of the things we have dreamed of. One of the biggest explosions is bringing GIS to people who are not GIS professionals, putting GIS in the hands of ordinary people, and the consumerization of it. Seeing members of your family naturally using a map because they have been exposed to it. The growth has just been phenomenal. ND: As CTO it is your responsibility to watch trends and keep abreast of the geospatial industry and of course keep up to date with Esri, so how do you identify what will and won’t work in the UK? CK: First of all, to keep on top of stuff, you have to be fundamentally interested in it, excited by it, and believe in it, and that makes understanding things easier; it’s not a struggle. That’s important: belief in what you’re doing and having the drive for it. In terms of trying to work out what works in the UK, I don’t think things vary that much across the world. I think the easier something is to use and [the more] relevant to what they do, the more people will adopt it and the more benefit they will find out of it. 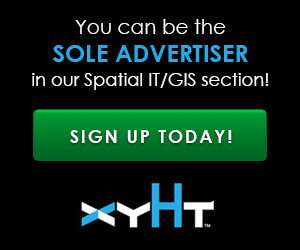 ND: For the readers of xyHt who may have only heard of Esri in the United States, how does Esri UK work? CK: Okay, so Esri Inc is a North American organization, privately owned in the US, and Esri UK is a privately owned business. We have a relationship with Esri Inc so we resell their software. It is a very close relationship, and we provide mutual advice and guidance; we provide the marketing effort and the support effort here in the UK. So, we are independent in terms of our company structures but we have a really close relationship with regards to our support and providing software. ND: Does this provide you any special allowances or benefits? CK: There’s over 80 distributers around the world so that Esri can reach their users globally. The benefit of that model is that you get hyper localization. So, to understand and use GIS in the UK, it helps if you understand the culture; this is the same in Saudi if you have a Saudi background or anywhere in the world. It’s about localizing the usage to the environment it is being used in, and that is a benefit of using that distributer model. But we do think of ourselves as one Esri, which is a group of people with one aim. ND: xyHt has a strong survey-based readership. Why doesn’t Esri have an “ArcSurveyor” add on, like it has the Military Analyst or the Network Analyst? CK: There is a long history with working with survey. In the past we had a dedicated survey analyst, but we found that we don’t necessarily require a dedicated system as there are multiple ways of working. So we use applications like collector to get the varying levels of accuracy that people are requiring. We are working closer with some of the survey companies, some very strong partnerships developing where they are building on top of the Esri platform to extend their own products. We wouldn’t be in business if we couldn’t integrate with every system out there. Over the last 3-4 years we have seen the growth of the drone industry, so now we have our Drone to Map product which we can take raw data right out of the drone and make mapping and information products from it. The one specific area where we are seeing the most growth is in survey partners who are understanding the ArcGIS platform better and building on top of it. ND: We hear that Esri is teaming up with Autodesk. In the public eye, you were always mortal enemies, so what has changed over the last couple of years? CK: I would never characterize us as enemies as we obviously have overlapping areas of interest. What has happened is a realization of the joint interests and understanding of the areas of strengths in the two parts of the geospatial world. You have the GIS and the integration of disparate units and viewing things across different levels of scale, and then you have the detailed, internal world of plans and BIM that goes down to which fire extinguisher has which mountings, etc. They are two different worlds in many ways but also share the same physical space. It’s the realization and understanding of each company’s respective strengths that has been enhancing that, so we understand that when it comes to the detailed architectural design building information space, that is what Autodesk is experts in. When it comes to the integration of all that information, that is what Esri is specialists on. ND: ArcGIS Pro, the flagship 3D GIS, is now so slick! It now feels more like a gaming software. With this in mind, are we likely to see more gaming/GIS cross-over or even simply exporting your 3D map into AR and VR? CK: With the ArcGIS Pro we are currently doing a lot of work on that. You can today take a piece of data, tag it in the right way, and export it into VR. It is very, very simple. There is already support for AR & VR in our ArcGIS Runtimes, but essentially the ability to use AR and VR within the ArcGIS environment is already there now. It will be developed and expanded rapidly. How that can be consumed will be looked at, though VR lends itself more than AR in my opinion. Fundamentally, it is just another dimension to what we do. It’s spatial data being related in a spatial system—it’s a bit of a no-brainer. ND: Is there anything you would like to say to the readers of xyHt? CK: It’s easier for users to obtain survey data—or at least what they think is good enough for survey—and their expectation is changing. The delivery method is changing, and it is now expected to be there and ready to use, so the main thing for them is there is a wide community out there that makes use of data in a way that many surveyors may not be aware of, and the more awareness they have of those uses, the more they can cater their data to be easier to use. We are now entering a time when it is easier and easier to obtain data that is just good enough and fit for the purpose, and the more you understand then the better chance you have of targeting what you are providing to them. You can’t replace good-quality survey or the metadata that goes with that. I think one of the most interesting areas for me is that phrase, “GIS is a generalization of the survey,” and I agree with that, and I think that something gets lost in the translation—the metadata that helps you understand the impact of the generalization and what error margins are associated with it. I think it’s really important for the survey world to understand the destination of what they provide and how much wider that is and the use cases that are being applied so they can work out what is relevant to the market and make the end result more attractive with the necessary information.